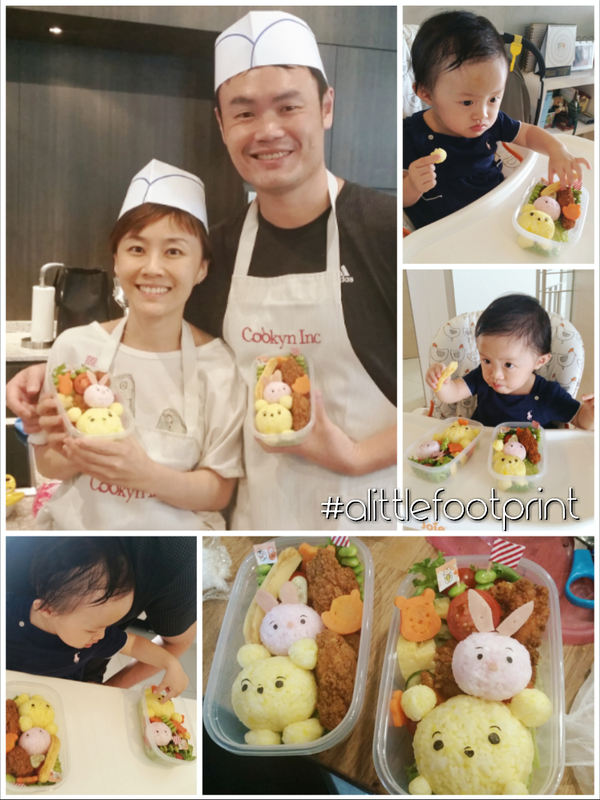 I had, on a whim, signed us up for a Winnie the Pooh Bento making session, conducted by Little Miss Bento. With much groaning this morning, we dragged ourselves out of bed, waved goodbye to Little Foot, and trotted off to take a bus to the class (our dear old car broke down and is in the workshop). Anyway, we had fun learning how to colour the rice, making the shapes for the characters, and cutting the seaweed for the eyes and brows. At one point, Papa Long lost Winnie’s eyebrows… and I was trying to reduce the size of Piglet’s nose until I felt a little cross-eyed. It was a refreshing kind of different Sunday for us…. more importantly, we got “we time” together. And then we made it up to Little Foot for going missing on Sunday Morning by presenting to her the bentos. Of course, some parts were not suitable for her to consume (e.g fried chicken and ham), so we removed those. Maybe one day when Little Foot is older and needs to bring lunchbox to school, Papa and I will find time to make such cute bentos for her, but I’m quite excited by the whole thing, so I hope to try making more when I find time.